The PFG has a strong emphasis on boosting our economy. We will increase investment in Scotland’s infrastructure so it is £1.5 billion per year more by the end of the next Parliament than in 2019-20. 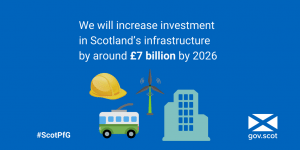 This increased investment – the most ambitious long term level of infrastructure spend that Scotland has ever seen – will drive connectivity, create jobs and deliver a long-term boost to productivity. In total this means around £7 billion of extra infrastructure investment over the period, and will help us support faster broadband, improved transport and more low-carbon energy. 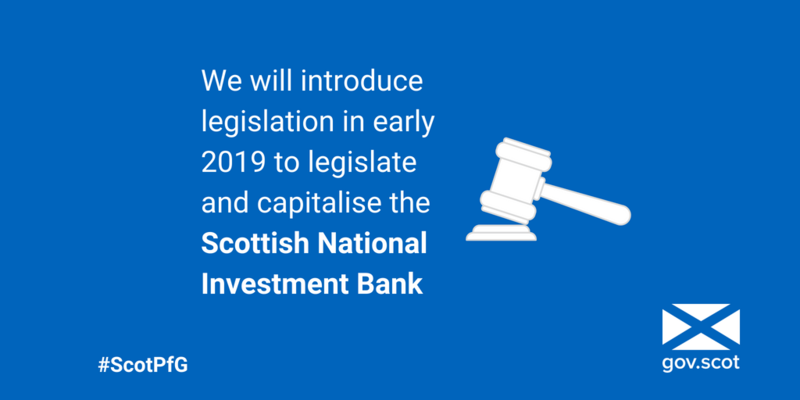 In a further transformational move, the First Minister announced that we will bring forward legislation in early 2019 to establish and capitalise the Scottish National Investment Bank. 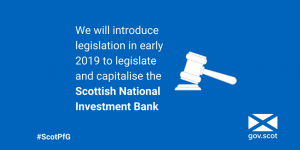 This week Economy and Finance Secretary Derek Mackay launched a consultation on how the Bank can support Scotland’s economy. 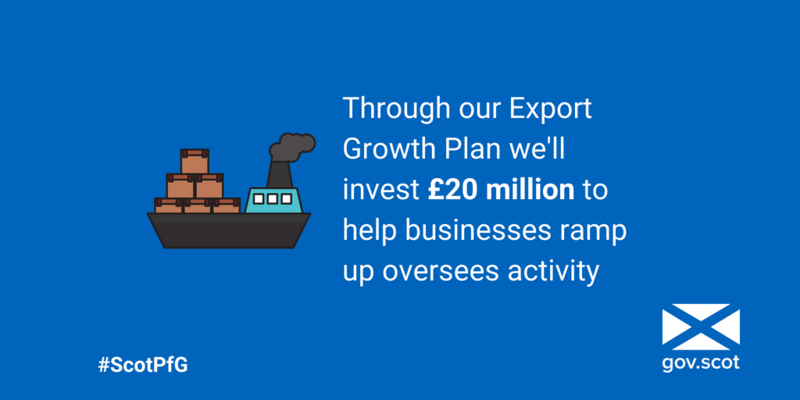 To support Scotland’s growing exports market, the First Minister announced that we will invest £20 million in an Export Growth Plan to help businesses ramp up overseas activity. The plan will increase financial support for companies looking to enter new markets and set up a new scheme that will create business-to-business peer mentorships for new exporters to learn from established exporters. Statistics published this week also show that the value of Scotland’s annual goods exports have increased by 7% (£1.9 billion) to £28.8 billion, a higher growth rate than the overall UK figure of 5% and the highest percentage increase of any UK country. 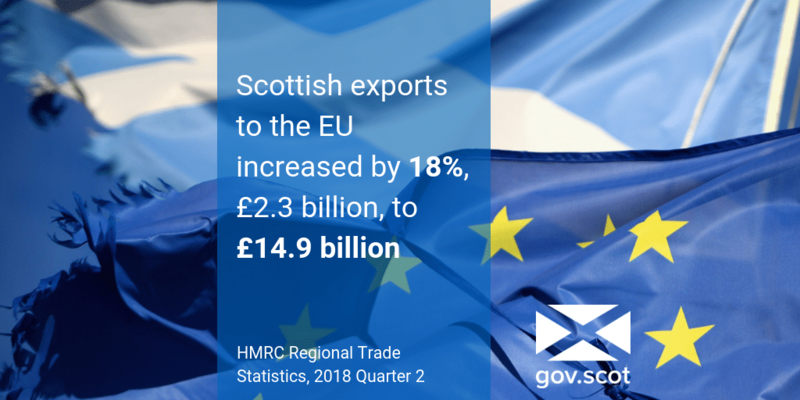 This was driven by increased exports of goods to the EU, up 18% (£2.3 billion) to £14.9 billion, and more specifically exports of oil and gas, up 29% (£1.6 billion) from £5.4 billion to £7.0 billion. Read the Programme for Government 2018/19 here. Scotland’s Economy Blog outlines the work of the Scottish Government to make Scotland a more successful country with opportunities for all to flourish through increasing sustainable economic growth.